Tolkien v. Orwell: Who understood modern surveillance best? Tolkien, not Orwell, understood today’s spying best. 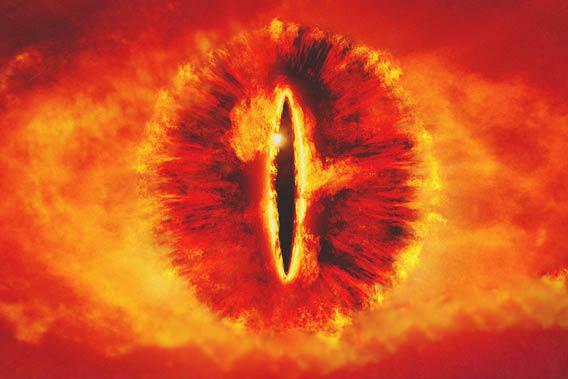 The Eye of Sauron, here in the film Lord of the Rings: The Fellowship of the Ring. What can literary fiction teach us about recent revelations that the National Security Agency has aggressively been gathering massive amounts of data on American citizens? The novel one usually turns to, of course, is George Orwell’s Nineteen Eighty-Four, with its terrifying vision of the Thought Police. Even President Obama, in response to questions about the NSA, has been forced to deny that the government has engaged in “Big Brother” tactics. Orwell’s book, however, isn’t the most compelling or accurate literary prediction of modern surveillance. That award goes to a less obvious title: J.R.R Tolkien’s Lord of the Rings. Tolkien’s most potent and intimidating image of centralized surveillance, the Eye of Sauron atop a tower, taking in the whole world, has resonated with those who are paranoid about government monitoring. But it’s Sauron’s vulnerability that has the most relevance for America today. Consider the basic premise of Tolkien’s trilogy: a small group of dedicated subversives willing to sacrifice their lives slips in under the surveillance system of a great power, blends in with an alien population, and delivers a devastating blow to the heart of its empire, leaving its security forces in disarray and its populace terrified. Even a tower or two crumbles to dust. Far from being covert, much of this operation is conducted in plain sight, with the great power aware of its enemies’ existence, if not their intent. Given its prescience about modern-day terrorism, Tolkien’s vision offers at least three lessons for present-day America. The most salient fact about Tolkien is not that he was a fantasist, but that he was Catholic: His Christian beliefs drove him out of realism and into a world of orcs, ents, and Dark Lords. That’s why The Lord of the Rings has been dismissed, as Edmund Wilson put it soon after the book’s publication in 1954, as “a children’s book which has some how got out of hand.” Yet the world he created allowed Tolkien to address problems that conventional realism had seemingly abandoned. The most important of them was the distinction between omnipotence and omniscience. In Orwell’s work (as well as that of other dystopian writers like Aldous Huxley and Yevgeny Zamyatin) those two terms are nearly synonymous: The Thought Police always know what Winston Smith is up to. But for a believer like Tolkien, only God can know everything. And in Sauron, Tolkien is able to imagine a figure of godlike power and seemingly infinite resources, but crippling interpretive fallibility. Sauron’s main problem, in a nutshell, is a lack of empathy: He is unable to conceive of anyone possessing a set of values fundamentally different from his own. For Sauron, power—embodied by the one ring—is self-evidently a good in itself. Therefore anyone who possesses the ring will attempt to use it and thus fall into his clutches. The thought that someone might choose instead to destroy the ring (and possibly destroy himself in the process) never crosses Sauron’s mind. He suffers from a crippling case of “confirmation bias”—a fundamental problem for every intelligence agency. We see the things we want to see, which is a problem when one’s enemies have worldviews utterly different from one’s own. Tolkien’s second lesson for us: Surveillance is typically reactive. Intelligence professionals try to anticipate and counter the actions of their opponents; this leaves them on the defensive. For all our justifiable fears of the “watchers,” the advantage is often on the side of the watched. Every act of surveillance entails a struggle over meaning, narrative, and plot, with the infiltrator often creating the story in a way that exploits the surveillance mechanism’s weaknesses. In The Lord of the Rings, determined individuals (Frodo, Gandalf) with an adequate understanding of the enemy’s blind spots are able to rebel in plain sight. This isn’t to say, however, that Tolkien was naive about the very real abuses of totalitarian power. Quite the opposite: He was every bit as repelled by the KGB and the Gestapo as Orwell or Arthur Koestler. In this respect, the most interesting sections of LOTR are the final chapter of Book IV and the first of Book VI. This is the sequence in which Frodo and Sam slip past “Homeland Security,” as it were, and evade the vast security apparatus on the borders of Mordor. Isn’t this a more convincing depiction than Orwell’s hyperefficient Thought Police (or Zamyatin’s Guardians) of how power actually works in a surveillance state? Without in any way shorting the terror of living under the secret police, Tolkien captures the way that power mistrusts its own agents, and how it deprives them of information. He captures both the cynicism and paranoia of surveillance work—and also how, in this mix of suspicion, disgruntlement, and incompetence, things do slip through. The security apparatus, of Mordor or the United States, is only as strong as its weakest link, and weak links abound. As a common saying in the intelligence community would have it, processing raw intel is like drinking from a fire hose. Most dystopian authors cheat their way around this problem, ignoring huge swathes of the population to get the volume of information down to garden-hose levels. Huxley lops off “eight ninths” of the populace through eugenics. Orwell imagines the proles—85 percent of Oceania—to be politically neutered and not worth watching. By contrast, Sauron, like the NSA, has no such luxury. As Tolkien understands, nothing is harder to parse than visible anonymity. And that is the state Frodo and Sam remain in, so long as they don’t wear the ring. How to recognize the treacherous or psychopathic needle in the haystack? As recent months have proved, it’s not so easy. Our surveillance state, in contrast to Orwell’s, has had its share of failures. A dangerous assumption underlies many contemporary debates about government surveillance: the assumption of interpretive competence. Without diminishing the seriousness of the recent NSA revelations, Tolkien is finally more convincing about why total surveillance often fails than Orwell and his endless progeny are in imagining its inevitable success. That’s at once some small comfort and reason for concern.